Steve notes that Schreiner and co claim a “structure with a rather strong CS double bond or a weak triple bond”. With this size of molecule, the proverbial kitchen sink can be thrown at the analysis of the bonding. But one technique that was NOT applied is ELF (see the earlier post using ELF to analyze the bonding in MgPh2). So here is such an analysis, computed for the CCSD/cc-pVTZ wavefunction at the geometry reported in the publication (see also DOI: 10042/to-2980). The (centroids of the) synaptic basins are the small purple spheres. The key (disynaptic) basin is labelled 10, and it integrates to 2.36 electrons, rather far from the 6 electrons which might be expected for a triple bond! Its centroid is also significantly off-centre from the S-C bond. Basin 11 integrates to 2.01 electrons; it resembles a lone pair on the carbon, although the ELF analysis actually labels it a S-C disynaptic basin. It approximately maps to the HOMO orbital. Monosynaptic basin 9 encompases the two formal lone pairs on the sulfur, and it integrates to 3.59e (quite often, what we regard as separate, rabbit-ear, lone pairs on an atom manifest only as a single monosynaptic basin). Completing the analysis are two further monosynaptic basins 6 and 7, which represent lone pairs on the oxygen (2.45e each) and the disynaptic basin 8 (1.1e). Bonding, much like the Humpty-Dumpty meaning, is very much what you want it to be! But in this case, one has to ask whether the description of the bonding in the C≡S region really is best described as a weak triple bond, or even a strong double bond, or whether the nominal six electrons of the triple bond split into two regions, one clearly bonding, the other more non-bonding. This entry was posted on Tuesday, December 1st, 2009 at 12:55 pm and is filed under Hypervalency, Interesting chemistry. You can follow any responses to this entry through the RSS 2.0 feed. You can leave a response, or trackback from your own site. Interesting analysis indeed! Since you have mentioned the “kitchen sink”, what does AIM have to say about the bonding in this molecule? Firstly, AIM has nothing to say about lone pairs, and so any situation where the controversy relates to whether a total bond can bifurcate into a bond and a lone pair is not going to be much illuminated by AIM. Perhaps the most interesting parameter which AIM can give is ∇2ρ, the electronic Laplacian, which like ELF, relates to the kinetic electronic energy. For the CS bond critical point, it has the value of +0.083 (and ρ itself is 0.280). Neither value says much in isolation, although the former does tend to indicate it has no significant charge-shift characteristics. Comparison with the diatomic CS might be productive, but remember it too might have carbene characteristics. AIM also tells us that the CS bond ellipticity in the Schreiner species is 0.59, which is typical of a double bond (that for ethene for example is 0.45). Both single AND triple bonds have low ellipticities. The integration according to AIM might be useful. Also, what is the value of ρ in CS – that comparison with Schreiner’s molecule could tell us the relative bond orders (along with the value of ρ in CH3SH). Regarding AIM integration, certainly the conventional meaning of a bond critical point is a point with particular characteristics of the curvature of ρ. To integrate one needs a volume of space, which a BCP is not. Perhaps there are other ways of achieving this however? As for ρ in CS itself, it has the value of 0.278. 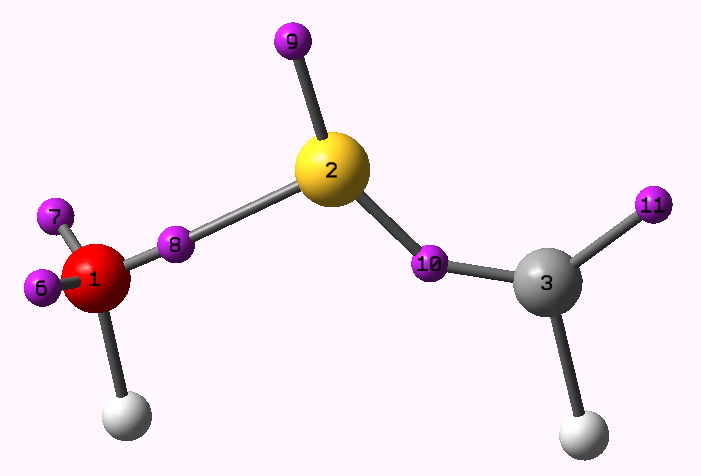 If one is in no doubt that CS has a triple bond, this points to the Schreiner compound also having one. But what if the diatomic CS were in fact :C=S with a double bond and a lone pair carbene? Comparison with CH3SH is a bit more illuminating. Here, ρ is 0.171 for the C-S bond. In other words, diatomic CS has a value for ρ at the BCP which is only around 1.63 times larger than for a single C-S bond. This does appear to imply that diatomic CS has a double bond, and it must cast more doubt upon it being as strong as a triple bond. Finally, ELF (CCSD(T)/cc-pVTZ) for diatomic CS reveals only three significant valence basins. A disynaptic basin in the CS region integrates to 2.94 electrons, a monosynaptic basin at C comes out as 2.37e, and a further monosynaptic basin at S emerges as 4.59e. I think all these tend to point to CS itself as having a double bond, and not a triple bond. I have spotted a further interesting feature of the ELF analysis. The lone pair 11 is nicely orientated for a stereoelectronic stabilization deriving from interaction with the S2-O1 σ* orbital (a typical anomeric effect). Such stabilization may promote its separation from the C-S region. The NBO analysis (CCSD(T)/cc-pVTZ) indeed shows a very large interaction energy between the C(Lp) and BD*( 1) O2 – S3 of 64.6 kcal/mol (normal anomeric interactions are around 15 kcal/mol) There is even a smaller such effect between 9 and the C-H bond of 8.3 kcal/mol. These interactions alone might explain the unusual angles in the species. The AIM and ELF analyses are interesting but do not alter the present picture of the nature of the multiple bond in the HCSOH (note that the model above has an incorrect caption). In our paper we had used several ways of evaluating the bonding situation; both AIM and ELF rely on non-rigorous electron localization and / or decomposition analyses that are not without criticism. Prominent examples include the faulty bond critical point (AIM) in the C4/C5 hydrogens in phenanthrene (Angew. Chem. Int. Ed. 2009, 48, 2592). a) When it comes to bonding one could safely say that the situation is clear-cut only for unstrained carbon-carbon bonds because the ratio of the force constants of ethane, ethylene, and acetylene nice comes out as roughly 1 : 2 : 3. A similar analysis of the title molecule yields 1 : 2.2 : 2.6 (2.8 for CS). As the force constant matrix depends on the choice of coordinates, we used the reciprocal compliance constants to eliminate this dependence; here we get a ratio of 1 : 2.4 : 2.3 (3.2). We are doubtful of the \2.3\ value and are corresponding with some experts about this. b) the geometry also has to be analyzed, as we have done in the paper. Since the bond lengths of the title molecule and CS are virtually the same, it is likely that their bond orders are comparable. c) the same is true for a comparison of the vibrational frequencies (see our paper). It is difficult to determine precisely bond orders for molecules beyond unstrained hydrocarbons. It is also clear that one criterion alone is insufficient for proper judgement. We just have to get used to the fact that the bonding world is not black and white but gray for most of the periodic table element combinations. In the present case, it is important to keep applying whatever analysis to reference molecules, here CS. Whatever bond order is assumed for CS should, following all analyses combined, hold true for the title molecule as well. In reply to Peter, who correctly reminds that AIM can be criticised in regard to non-realistic bond critical points (although they are quantum mechanically rigorous of course), my main post did not include AIM. As I also pointed out in a reply to Steve Bachrach, AIM tells us nothing about lone pairs, and it is not quantitative about the integrated electron density. What also needs calibration is the relationship between ρ and the bond order. It is perfectly obvious that eg ρ for a double bond is not twice ρ for a single bond, and the increment for a triple bond likewise needs calibration. Peter also notes the non rigorous electron localization in ELF (this non-rigor is often quoted as a criticism, but it is no less non-rigorous than the semi-empirical DFT methods, which are widely accepted). But point 11 in the ELF is also found in the NBO analysis, which was performed in the original article. The donor-acceptor interaction energy in NBO analysis between point 11 and the S-O bond IS large (unusually so) and I think this is also key to the whole issue. Further results pertaining to this specific point will appear shortly in a follow up to the original post. With regards to peter’s comment above, I think it is important to keep in mind that all bonding concepts are simply models. No chemical bond is observable. The traditional bonding/antibonding orbital picture is simply a model of the total electron density. The canonical orbitals are no more real that the natural bonding orbitals. And bond models have been criticized for years – and Henry’s blog posts (not just this one) serve to remind us just how gray the MO picture can really be. The “failures” of AIM and ELF are ultimately no different that the failures of any and all models – they are incomplete representations of the full picture – in our case the total electron density. So, it is really a simple cop-out to not tackle the AIM and ELF results straight on. I think Henry has made a strong case building on peter’s results that the bond order for the C-S interaction is quite nebulous and calls further into question the limits of our simple bonding picture of even small seemingly straightforward compounds.